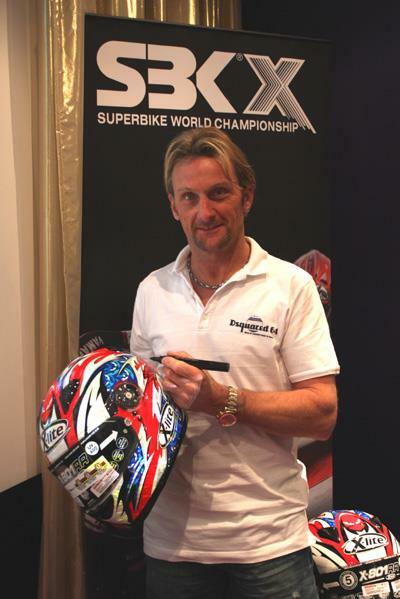 ﻿ Win a signed Helmet by Carl Fogarty plus a copy of SBKX game and bag! We have four copies of the SBK game for runners up: a copy of the game ( either PS3 , X-Box or PC DVD), Carl Fogarty’s autograph and SBK X bags. SBK X is the official Superbike World Championship game for PlayStation 3, Xbox 360, and PC DVD. SBK X features 1000cc and 600cc machines from Aprilia, BMW, Ducati, Honda, Kawasaki, KTM, MV Agusta, Suzuki, Triumph, and Yamaha with the 14-track racing roster, which includes Germany’s notorious Nürburgring and Britain’s thrilling Silverstone. The game features arcade and simulation modes, and there’s also a Special Edition version of the game, which includes a unique Legendary Roster of the world’s greatest World Superbike Series Stars. Every bike enthusiast can ride as Carl Fogarty on his powerful Ducati 996, or as Ben Spies on last year’s Yamaha R1: Past versus present, ageless glories versus new heroes. Developed by renowned Italian developer, Milestone Studios, and published by Black Bean Games, SBK X harnesses the thrills and exhilaration of this international racing series in spectacular detail.